We all know how we should eat. We’re intimately familiar with advice from experts like Michael Pollan: Eat real food. Not too much. Mostly plants. It’s sensible and easy to understand— yet more than two-thirds of U.S. adults are overweight or obese. Clearly, some part of us doesn’t want to listen. Our rational brains know that to lose weight, we need to eat the right foods in the right amounts. But our stomachs get in the way, making excuses and telling us lies that hinder our fitness goals. The body often tricks the mind into believing lies that undermine our desire to be healthy. These deceptions can make us overeat based on emotions, distort our perception of ourselves, and sap our energy until we’ve lost all motivation for change. The lies start small but can lead to a lifetime of health problems if we don’t challenge them. Lie No. 1: I’ll achieve my goals… later. Our bodies are notorious procrastinators, coming up with a million excuses to convince our minds that we can’t achieve our fitness goals: We’re too tired, too weak, too old, etc. We focus on past failures with the intention of finding solutions to our current problems, but ruminating on bad feelings is actually associated with less proactive behavior. The truth is, our bodies have about as much willpower as a child. You wouldn’t let a child dictate your life, so why would you give your body that control? The best results come from looking to the future and walking straight toward your goal, even when you’re tired or unmotivated. Lie No. 2: Not every decision makes a difference. It’s easy to let your guard down and rationalize: It’s just one slice of pizza. It won’t make a difference in the long run. 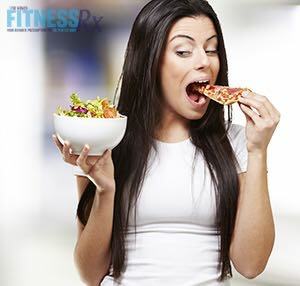 While setbacks shouldn’t derail your goals, every slice of pizza (and every piece of broccoli) does count. Studies have found that people who focus on their future selves will delay gratification to get a bigger return. Philip Graves, a consumer behavior consultant, has noticed virtually none of the hundreds of economists he’s worked with are overweight. Graves suggests that economists, who spend most of their time trying to predict future patterns, are primed to recognize the long-term consequences of day-to-day decisions. My clients often believe that if only they were 10 pounds lighter, they’d be able to take care of themselves and eat properly. This is a self-sabotaging lie. The perfect place to start your fitness journey is wherever you are right now. Lie No. 3: I can control my impulses to overeat. How many times has this happened to you? 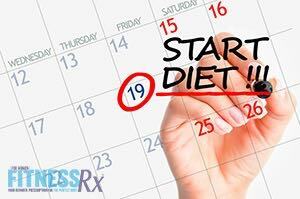 You wake up and decide that today is the day you’re going to start eating less. You’re careful to make good choices and stop eating when you’re full, but by evening, your emotions cause you to finish a package of cookies without realizing it. People are prone to restraint bias, the belief that we’re able to control our natural urges better than we actually can. Studies have shown that people who think they have the most willpower are actually the most likely to give in to impulses. Their inflated belief in their own self-control leads them to overexpose themselves to tempting situations. Research shows that willpower is a limited resource. Some have compared it to a muscle that becomes fatigued with overuse. If you have sweets in your house, for instance, you’re probably going to eat them sooner or later. The best way to retain control is to remove the temptation from your environment. Don’t allow junk food in your home, and keep healthy options like fruits and vegetables available for when you’re craving a snack. Don’t do it alone. Find a coach who supports you and has your goals in mind. Your friends and family are not good candidates because they’re most likely struggling with the lies their own bodies are telling them. A coach can encourage you from a healthier, more objective place. Train your mind to succeed. Every morning, envision 10 fitness actions to achieve during the day, and aim to complete at least five of them. Before bed, list five successes you achieved that day, and create positive affirmations in your mind. Prepare to achieve your goals. Preparing a week’s worth of meals on Sunday means you can start the week armed and ready to achieve your goals. Careful advance planning helps you avoid scrambling to put together a meal, which often leads to failure. Ultimately, your fitness goals for the future are shaped by each decision you make, no matter how small they seem. Your body may not appreciate the sacrifices you’re making today, but if you invest in a healthier you, your body will thank you for years to come. Shawn T. McIntyreis the founder and CEO of Shawn McIntyre Fitness. Shawn is a professional fitness model and trainer who offers online training, as well. Shawn is dedicated to helping and inspiring people to take action with clarity and power — not fear. He coaches clients to help them achieve success in fitness and life.